Passed away peacefully on Tuesday (19.03.2019). Loving son of Ranee and John (dec), Brother of Dean and brother-in-law of Jackie. Rick and Tracey together had three beautiful children, Brett, Kristie and Cindie. Pop Rikta of Anton, Hannah-Lee, Mico and Katana. Lived life to the fullest and left us all too soon. Always Remembered. 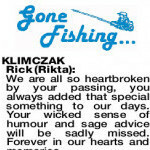 The Funeral Cortege for Mr Rick Klimczak will arrive at the main entrance of KARRAKATTA Cemetery, Railway Road, Karrakatta at 2:30 pm on MONDAY (1.04.2019) for a Cremation Service. 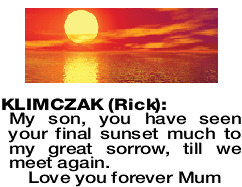 KLIMCZAK RICK My son, you have seen your final sunset much to my great sorrow, till we meet again. 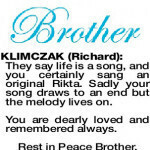 KLIMCZAK RICHARD They say life is a song, and you certainly sang an original Rikta. Sadly your song draws to an end but the melody lives on. You are dearly loved and remembered always. Rest in Peace Brother. Love, Dean. We are all so heartbroken by your passing, you always added that special something to our days. Your wicked sense of humour and sage advice will be sadly missed. Forever in our hearts and memories. 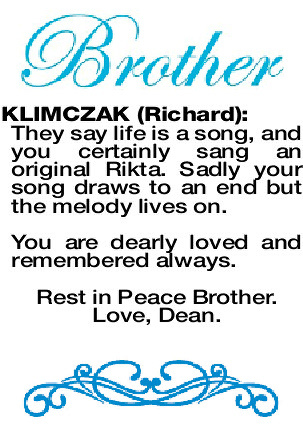 Deepest sympathy to Ranee and Dean on the sad loss of your son and brother. 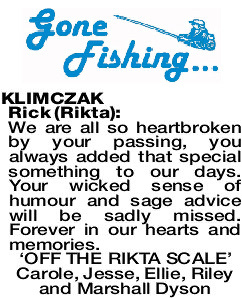 Rest now Ricky. Coral Sydoruk and boys.